Some things don’t change. I recently bought Useful Ideas, published in 1952 by Popular Mechanics magazine. The book contains hundreds of hints and tips for those working with their hands. Here are ten of them. When using a drill to make holes in thin sheet, the sudden breaking-through of the drill bit often results in the end of the chuck impacting the work, ruining the finish of the sheet. 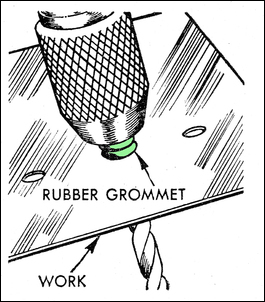 To avoid this occurring, fit a rubber grommet over the drill-bit – this cushions the impact. Especially when worn, a bench vice can have lots of slop in the thread. This doesn’t cause any problem when the vice is tightened, but it can make the initial clamping difficult, especially if you’re trying to insert a ‘sandwich’ of pieces in the jaws. 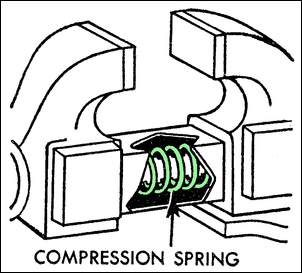 To overcome the thread slop, remove the front half of the vice and place a compression spring over the threaded rod before reassembling. The slop will be gone. And another vice hint. It’s easy to pinch your fingers in a vice handle, especially when the handle unexpectedly slides downwards through the shaft hole. 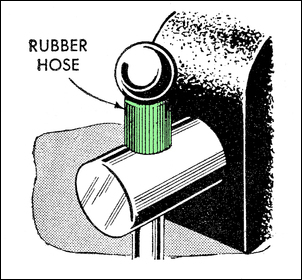 However, it’s simple to avoid this by slitting a short length of rubber hose and slipping it over the handle, one each side of the main shaft. Storage doesn’t get much cheaper than this. 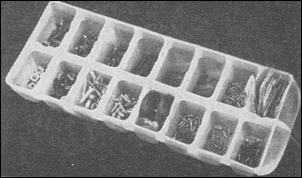 If you need to store sorted tiny objects (like circlips, tiny nuts and screws, etc) just buy a couple of fridge ice cube trays. They’ll stack on top of each other and keep all the bits and pieces in their right places. And they’re much cheaper than buying specialised screw trays! 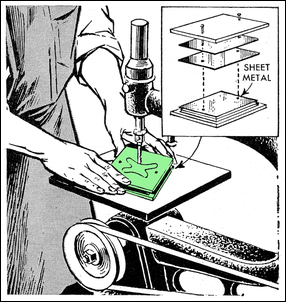 Cutting thin metal with either a bandsaw or jigsaw can be problematic as the metal tends to chatter. But if you sandwich it between two sheets of scrap hardboard, the chatter stops. The pattern that’s being followed in the cutting can be marked on the upper hardboard, allowing you to still cut accurately. Screw the sandwich together, inserting the screws through the waste part of the job. If you regularly work on a machine that uses just three or four sizes of hex-key bolts, here’s a handy tool you can make. 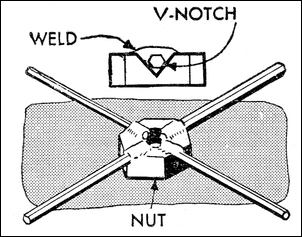 Cut across a large nut two vees at right angles to one another. Cut the hex keys to an appropriate length and lay them in the vees, welding or brazing them in place. Grind the welds back for a smooth finish. Ensure that during the welding the working ends of the keys don’t get too hot and so have their temper ruined. 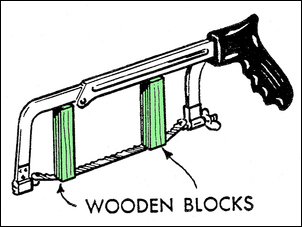 If you need to cut off a bolt flush with a surface, turn the blade of a hacksaw sideways and then use two blocks of wood to offset the blade further downwards. 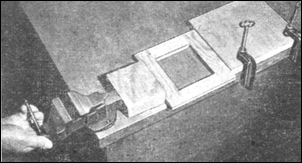 The saw is then held as for normal use but with pressure applied sideways. 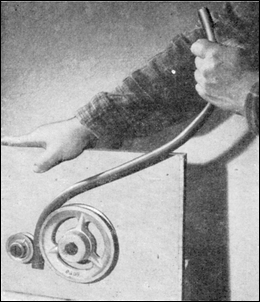 If bending soft tube like aluminium or copper, use two different sized V-pulleys mounted slightly apart on a board. By working the tube between the pulleys, different radii bends can be easily formed with much less chance of the tube kinking. 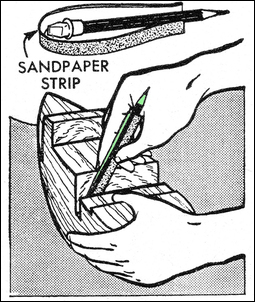 If you need to sand a recessed grove or inner corners of a box, use a pencil of the type that has an eraser on one end. Wrap a thin width of sandpaper around the rubber and you’ll be able to reach those otherwise hard to reach places. If you have a need for a bar clamp, one can be quickly improvised by using the rear end of a bench vice. A G-clamp is used to make a ‘stop’, with the items to be clamped placed between the stop and the back end of the open vice. The vice is then screwed closed, pressure being applied to the clamped object.